As the economy slowly recovers, an important question is: What will happen to the participation rate over the next few years? On Sunday I pointed out that demographers expected the participation rate to start declining even before the great recession started. The expected gradual decline was due to the aging of the overall population. Note: The participation rate is the percentage of the working age population in the labor force. 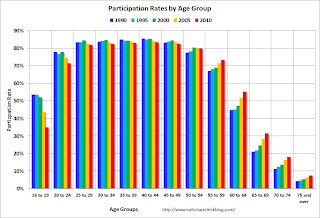 One difficultly in projecting the participation rate is that the age group participation rates change over time. 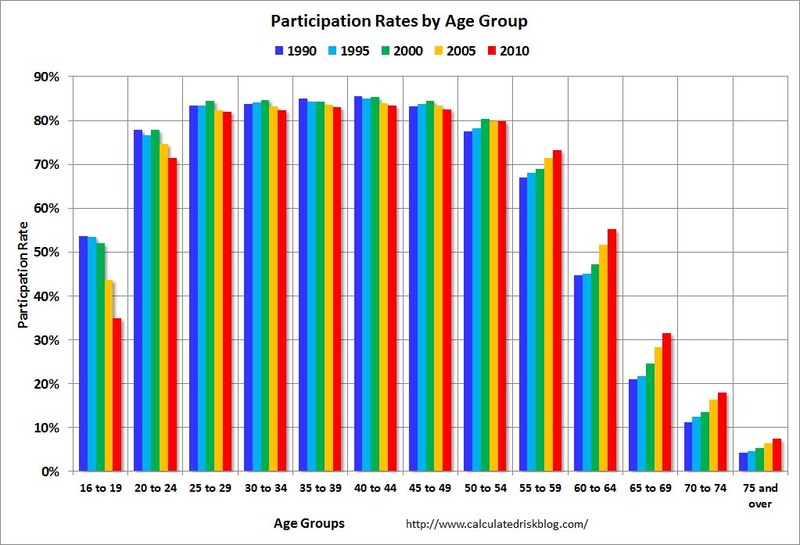 The participation rate for the '16 to 19' age group has been declining for some time, and the participation rate has been increasing for older age groups - perhaps because of necessity, perhaps because of fewer "back breaking" jobs. Here is a graph showing the trends by age group since 1990. The participation rate is low for those in the '16 to 19' age group. The rate increases sharply for those in the '20 to 24' age group, and the rate is at its peak from 25 to 49 - and drops off a little for the '50 to 54' age group. After 55 workers start leaving the labor force, and the participation rate falls off with age. The participation rate has been declining for the younger age groups, although some of the recent decline for the '20 to 24' age group is probably related to the recession (perhaps more people staying in school). Even though the participation rate is rising for the older age groups, the increase doesn't offset the aging of the population. As an example, when the current '55 to 59' age group moves into the '60 to 64' bracket, the participation rate for that cohort will decline from 73% to 55% or so. And with a fairly large cohort moving into the older age brackets, the overall participation rate will probably decline.